The CEO Pay Ratio will also bring an additional data point to the issue of income inequality, and may even influence change in public policy on wages, employment, and trade. 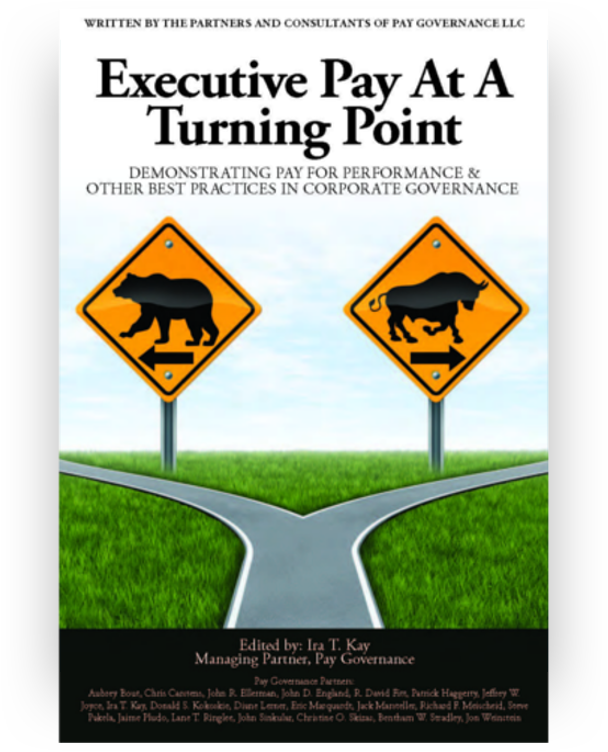 However, the pay ratio is unlikely to have any near term direct influence on any individual company’s executive or employee pay decisions. 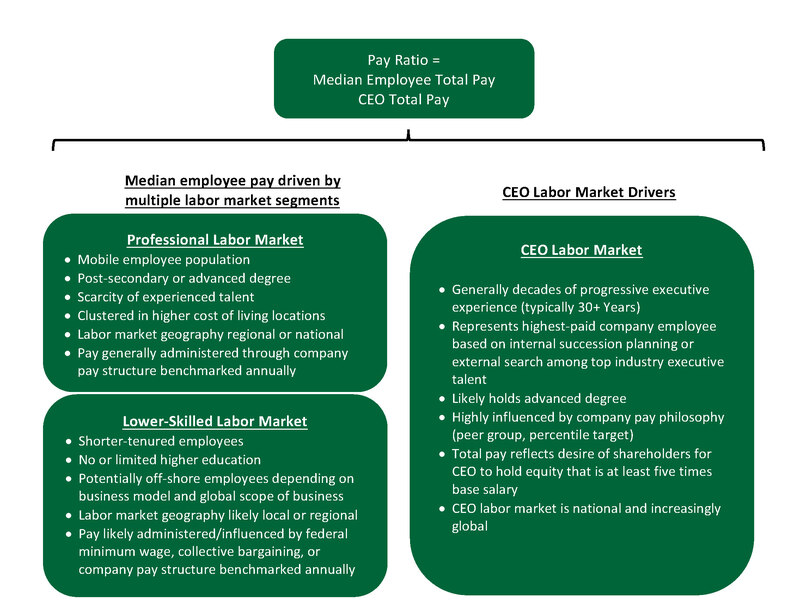 Both CEO pay and broad-based pay are already set based on closely-monitored competitive markets, and deviation from these practices based on the pay ratio could affect the competitiveness of a company’s business operations. Pay Governance believes that it will be critical for companies to provide contextual commentary when presenting their pay ratio. Simply disclosing the required statistics and allowing investors and employees to draw their own conclusions is not an optimal communications strategy. This Viewpoint provides perspective on the nature of the pay ratio for companies to consider in providing contextual disclosure of their ratio. This context is needed to reduce the risk of criticism of otherwise sound business practices. The pay ratio disclosure requirements create a new company-specific metric to measure intra-firm income inequality. While income inequality is more traditionally measured across the entire income distribution using the Gini Coefficient3, the CEO pay ratio focuses on the gap between the ~3,600 chiefs of US public companies and the other employees of their particular company. The information contained in the CEO pay ratio may be more precise than similar previously available information, but the overall knowledge represented by the company-disclosed ratio is not particularly new. Since CEO pay for public companies is already disclosed in the Summary Compensation Table of the annual proxy, it is easy to calculate an estimate of a CEO pay ratio by comparing the CEO’s total pay as disclosed in the Summary Compensation Table to the US median income, or median earnings for a particular industry.4 Put simply, we already know that the CEO pay ratios for most companies will likely range widely from 1:100 to 1:1,000, and industry differences will be significant, as noted later in this Viewpoint. There is no question that income and wealth inequality are important social and political issues in our contemporary society. The factors impacting the earnings and purchasing power of the median household include many macroeconomic and policy factors beyond the scope of this Viewpoint: economic growth, increasing worker productivity, capital investment, education, trade policy, geographic location, and public policy. Instead, we focus on helping companies to frame the microeconomic story behind their own CEO pay ratio, and how to communicate that story to their shareholders. 1.) Is the comparison of pay levels in two dramatically different labor markets of value to investors? If we deconstruct the CEO pay ratio, it represents the ratio between pay in two dramatically different employee labor markets. The denominator, CEO pay, represents pay for one group of individuals: the most qualified strategic leaders in an industry with decades of progressive executive leadership experience. The CEO pay values reflect a labor market with extreme scarcity of qualified strategic talent. In contrast, the median employee, the numerator of the ratio, will differ among companies and primarily reflect labor market conditions in subsets of the much broader employee labor market. If a predominance of workers at a particular company are early-career employees with a short tenure and limited specialized skills, median pay will be relatively lower. If this median employee is a craft or professional employee, tenured and highly skilled, the median employee pay will be relatively higher. The graphic below illustrates the drivers of the respective labor markets for CEOs and broad-based employees to illustrate that the two labor markets are generally not comparable. 2.) How does industry and the market for broad-based talent drive the CEO pay ratio? The operation of each company in the example above is based on employees with different skills sets generating value in different ways at different scales. While the software company generates $45,000 of profit per employee, the retailer generates about a third of that amount of profit per employee. On the other hand, the typical retailer employs five times the number of people as the software company. The business model that creates shareholder, customer, and employee value in each of these two cases is based on a staffing strategy that efficiently meets the needs of the business, employees, and customers. 3.) 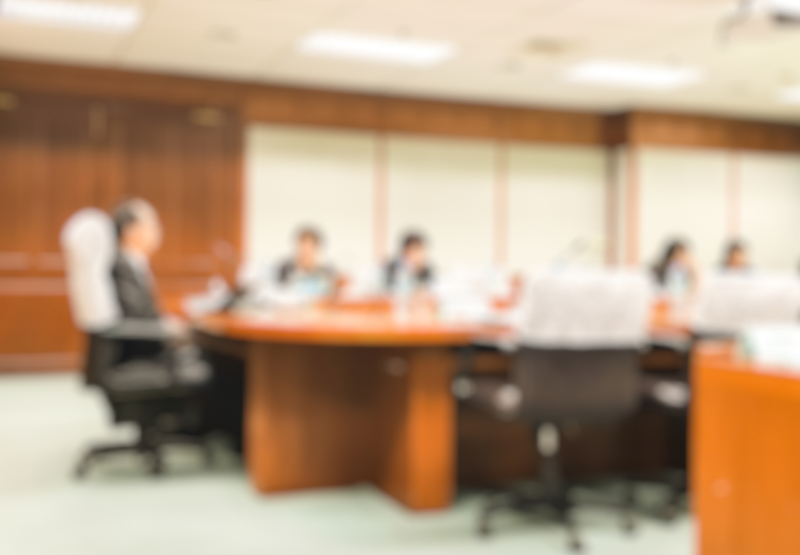 What are the primary risks and opportunities for a Board in discussing the CEO pay ratio in the proxy statement? How much supplemental commentary is appropriate? While the SEC rules describing the CEO to median employee pay ratio specify the technical nuance of the ratio calculation, they leave open the question of how companies may wish to supplement the numeric disclosure, if at all. Several companies have disclosed the pay ratio early, although these companies generally had low ratios (less than 1:100) and have generally not provided additional context beyond the results and methodology underlying the ratio. Our perspective is that any additional disclosure should be sufficient to address the interests and anticipated concerns of a company’s employees and investors. Any expanded disclosure in the proxy that attempts to address related media or public policy perspectives on this ratio, especially the relative size of a company’s ratio in the general U.S. public company market, is potentially risky and unlikely to have either a highly predictable or satisfactory outcome. With employees, additional disclosures in this area should focus primarily on demonstrating objectivity and an intent to be fair. By definition, half the employees in the company will be paid below that median number, and as a result, potentially be disappointed or even demotivated. In companies with very large and predominantly lower-wage employee populations, the resulting cluster of wages around the median should reduce the need for substantial additional discussion. In a smaller, more diversely-skilled workforce where wage dispersion is significant, publishing this median statistic may create more employee relations concerns and require additional disclosure around objectivity and fairness. We would not suggest companies explain in detail how their dispersion of pay occurred or directly address the specific differences in pay among segments or levels of its employees. However, a description of the experience, skill, and tenure of the typical employee6 would provide perspective for other employees or outside observers. Some brief explanation of the tools and processes used in setting broad-based pay, such as market pay surveys, internal job evaluation tools, or collective bargaining, may also be used to demonstrate fairness and objectivity. 1)	CEO pay is designed to provide a competitive CEO pay package with significant performance-based pay in a highly-competitive CEO talent market. 2)	Median employee pay represents the company’s compensation payments to employees at various rates based on closely monitored competitive labor markets. 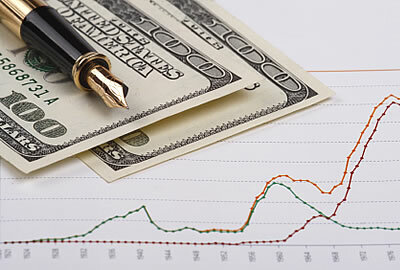 Some companies may wish to address the pay ratio by noting that the company’s strategic and operating decisions consider the interests of shareholders, customers, and employees - including the effects on employment and employee wages. 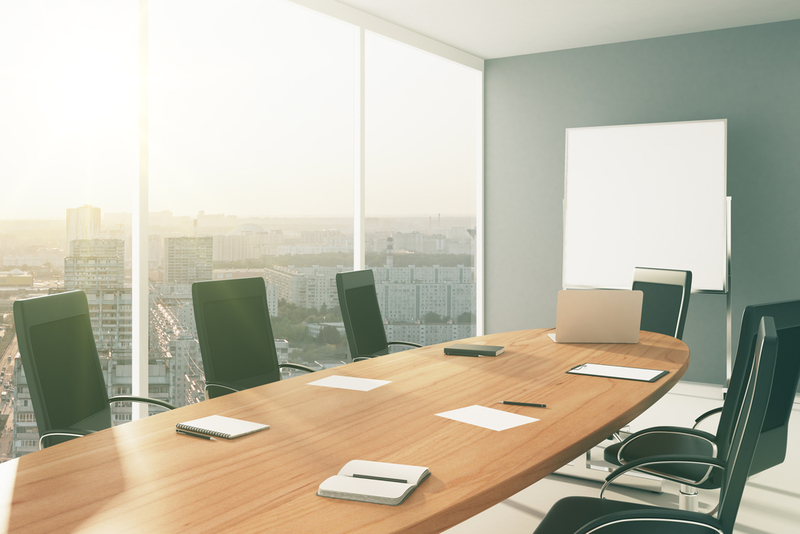 Any additional disclosures related to the CEO Pay Ratio should not, however, introduce new business information previously not filed or disclosed to investors. 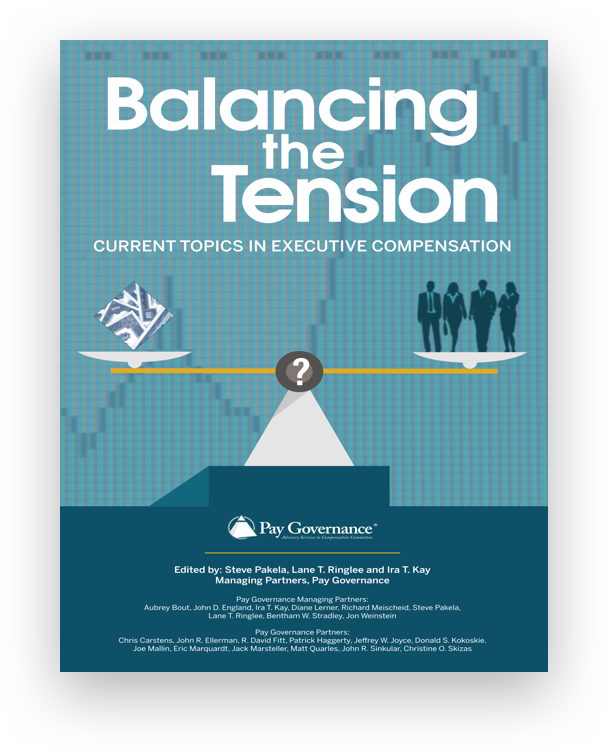 As companies work to complete preliminary calculation of their CEO Pay Ratio and determine related communications in preparation for the 2018 proxy statement, Pay Governance recommends a pragmatic approach to determining and disclosing the result. For example, choices among the available methods to identify the median employee must be weighed against their relative cost and overall impact on the accuracy of the final ratio. On disclosure, each company must carefully consider how much commentary or supplemental information will be value added for its investors and employees. We believe that an approach reiterating the value a company’s business and staffing models provide to shareholders, employees, and customers provides appropriate context for this new disclosure. 1. § 229.402 (Item 402) Executive compensation. Pay Ratio Disclosure Final Rule. https://www.sec.gov/rules/final/2015/33-9877.pdf. August 5, 2015. p282. 3. The Gini coefficient is a measure of statistical dispersion intended to represent the income or wealth distribution of a nation’s residents. A coefficient of 100% is maximal inequality where one person has all, or nearly all, the income. A coefficient of 0% expresses perfect equality where everyone has the same income. 4. Estimates of the CEO pay ratio have been provided well in advance of the required proxy disclosure by Bloomberg, Harvard Business Review, Pay Scale Human Capital, and the Wall Street Journal, among others. 5. Illustrative data based on median statistics for industry cut of S&P 500. 6. Companies should not disclose the demographics of the specific median employee used in the pay ratio calculation.